Note: user account creation on this site has been disabled. If you select a term with children (sub-terms), do you want those child terms automatically included in the search? This requires that "Items containing" be "any." "Events" is used for: Convention Post, Page, Story. "People" is used for: Page, Convention Post, Story. "Themes" is used for: Page, Convention Post, Story. warning: Creating default object from empty value in /home/draganos/sf.geekitude.com/modules/taxonomy/taxonomy.pages.inc on line 34. 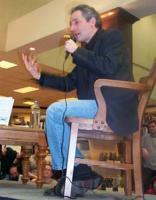 On March 7, 2005 Brian Greene, a string theorist and author of "The Elegant Universe" and "The Fabric of The Cosmos", gave an interview at a Barnes & Noble in Austin. He was interviewed by Jeff Salomon from Austin-American Statesman and took questions from the audience. The topics involved: What kind of experiments can possibly verify string theory? How and why would you look for astronomical evidence of strings? Would it make sense to look for confirmation of string theory in the possible violations of the Second Law of Thermodynamics? What is Brian Greene's own interpretation of quantum entanglement? What does it mean that space and time are not fundamental? In what sense is space-time analogous to temperature? What's next for physics after TOE? Will there be anything left to do, or will science come to an end? And, umm... does Brian Greene feel a need to reconcile psychic phenomena with the unified physical theory? 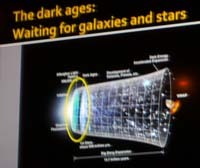 The talk also revealed some things you would not immediately think of Brian Greene. By his own admission, he finds physics hard and visualisation helps him enormously to understand physics concepts. That's one reason why he never condescends to his audience. (Another may be that he is simply a nice person.) Also, did you know that Brian Greene's books can cause people to quit drinking and start reading? Note: I could not hear everything that was said or write it down verbatim, so I paraphrased some places the best I could. Most of them are in angle brackets. First, the panelists admitted they didn't really understand the topic of the panel as stated in the program book. They didn't get much mileage out of "scientific worldview elements moving a concept out of fantasy". After addressing the distinction between technology and magic, and Ted Chiang stating why he believes Clarke's famous adage is incorrect, the panelists quickly became mired in the age-old debate of what is science fiction, and what is fantasy. Oh no, not again, you say! Well, this discussion wasn't quite like beating a dead horse. I heard some interesting insights. A lot of western fantasy writers prefer magic to be systematic, i.e. to have laws, rules, constraints. An arbitrary magic, where everything is possible or impossible, depending on whether it is convenient for the author, they don't find very interesting. But does systematizing magic move it closer to science? Not necessarily. 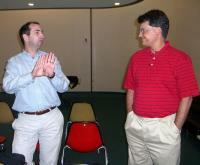 My then-husband S (left) found common ground with Colin, as they both used to be graduate students in particle physics. Colin gave a talk on high energy physics at the Center For Inquiry Austin meeting on August 13, 2007. I am tempted to put a bubble above Colin's head: "My detector was thiiiis big!" 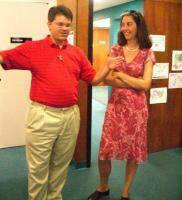 :-) Colin and his wife Jennifer socialize before Colin's talk on high energy physics at the Center For Inquiry Austin on August 13, 2007. 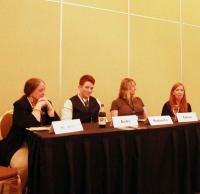 Mel White (who has a Ph.D. in information sciences), Rachael Acks (a geologist), Paige Roberts (data scientist), and Sigrid Close (a professor in the Department of Aeronautics and Astronautics at Stanford University and ArmadilloCon 2014 science Guest of Honor) at the Women In Science panel. 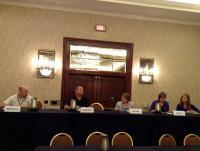 Mars 1 Dream Team panel. Left to right: writers Bob Mahoney, William Ledbetter, Patrice Sarath, Alexis Glynn Latner, and aeronautics/astronautics professor Sigrid Close. 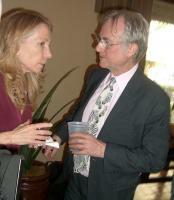 On March 19, 2008 Richard Dawkins, the famous evolutionary biologist and popularizer of science, gave a public lecture at the University of Texas in Austin; it was preceded by a reception hosted by the Center of Inquiry Austin. Though I didn't have a chance to exchange more than a few sentences with Dawkins at the reception, I formed some kind of impression of him as a person. For example, he speaks in perfect phrases and is hip on technology. (Though I bet he would never use the word "hip". :-)) His lecture topics I found familiar, even though I haven't read his books where he expounds on them. I guess I've absorbed his ideas by osmosis. The questions the audience asked revolved around whether atheists should adopt an in-your-face or a conciliatory tone with general public; some of the questions were more unusual. (Would you ask a well-known skeptic to support his reasoning with astrology? :-)) Then someone asked what Dawkins thinks of transhumanist visions. Finally, a concept he wanted us to take away from this lecture, if it was the only thing we would take away: why evolution is NOT equal to random chance. What armchair "scientists" get out of reading popular science magazines or websites? Mostly they get excited about "out there" speculation that gets batted on wired.com or io9.com. Holographic universe. Preferred direction in the universe. What a real astrophysicist's answer to "what do you think about this?" is: nothing. 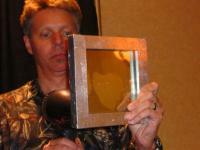 Wil McCarthy, a scientist and science fiction author, was the Guest of Honor at ApolloCon 2009. He gave a talk on the work he's been doing in programmable matter. He started off by showing the audience a piece of clear glass. Then he heated the glass with a hair dryer. An irregularly shaped reflective blob grew on the glass -- the heat turned the glass reflective. This was McCarthy's demonstration of materials he's working on in his startup. Definitions and discussion of programmable matter can be found elsewhere on the web, and McCarthy did not dwell on the theory, but talked about his work in this area. His practical work in programmable matter developed from his nonfiction book "Hacking Matter", which it turn was born from his fiction. He talked about the events that lead to writing of "Hacking Matter", and how it attracted investors' interest, leading to creation of programmable matter startup. McCarthy talked about his company's journey to discovery of viable commercial applications for these materials, and why he avoids the word "nanotechnology" for marketing this technology to investors. He briefly discussed weapon potential and security issues of programmable matter with the audience. Finally, he talked about balancing his science and writing careers, or rather, impossibility thereof. Pictures from ApolloCon 2009 are available in my photo gallery. 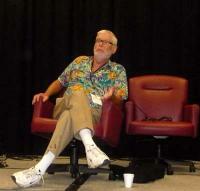 Science fiction writer and physics professor Gregory Benford was the Guest of Honor at Fencon 2008. On several occasions during convention he shared his thoughts on topics such as American dominance in the world and its role to play in the technological future. Having been in science fiction fandom for four decades, Benford is proud of American science fiction and fandom influence on the world, which he puts in such blunt terms as "We own the future". At the same time he acknowledges that the future is not all rosy, and that science fiction may be the proverbial canary in the coal mine, signaling of darker times to come. Benford's keynote speech on Saturday was the problems facing the world and what can be done about them. Of those, global climate change was the most significant issue. He assured us that whatever is being done to counter it isn't working, because global warming is typically viewed as a moral problem (excessive consumption), when it needs to be seen as an engineering problem. To that end he proposed an unconventional -- or perhaps little known -- approach. At the end of his speech he spent some time on space travel and overpopulation. Gregory Benford also appeared in the "Science -- fact or crap?" game at Fencon, where two teams of players competed regarding their knowledge of science facts. Read more about it in my blog.